"Studio City" redirects here. For other uses, see Studio City (disambiguation). 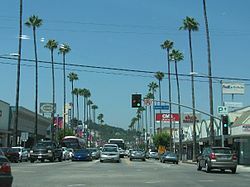 Studio City is a neighborhood in the city of Los Angeles, California, in the southeast San Fernando Valley, just west of the Cahuenga Pass. It is named after the studio lot that was established in the area by film producer Mack Sennett in 1927, now known as CBS Studio Center. Originally known as Laurelwood, the area that Studio City occupies was formerly part of Rancho Ex-Mission San Fernando. This land changed hands several times during the late 19th Century and was eventually owned by James Boon Lankershim (1850–1931), and eight other developers who organized the Lankershim Ranch Land and Water Company. In 1899, however, the area lost most water rights to Los Angeles and therefore subdivision and sale of land for farming became untenable. Construction of the Los Angeles Aqueduct began in 1908 and water reached the San Fernando Valley in November, 1913. Real estate boomed, and a syndicate led by Harry Chandler, business manager of the Los Angeles Times, with Hobart Johnstone Whitley, Isaac Van Nuys, and James Boon Lankershim acquired the remaining 47,500 acres (192 km2) of the southern half of the former Mission lands—everything west of the Lankershim town limits and south of present-day Roscoe Boulevard excepting the Rancho Encino. Whitley plotted the area of present-day Studio City from portions of the existing town of Lankershim as well as the eastern part of the new acquisition. In 1927, Mack Sennett began building a new studio on 20 acres donated by the land developer. The area around the studio was named Studio City. In 1955, Studio City's Station 78 became the first racially integrated station in the Los Angeles City Fire Department. The 2000 U.S. census counted 34,034 residents in the 6.31-square-mile Studio City neighborhood—5,395 people per square mile, among the lowest population densities for the city but about average for the county. In 2008, the city estimated that the resident population had increased to 37,201. In 2000, the median age for residents, 38, was considered old for city and county neighborhoods; the percent of residents age 19 and older were among the county's highest. The ethnic breakdown was whites, 78%; Latinos, 8.7%; Asians, 5.4% ; blacks, 3.7%; and others, 4.1%. Iran (7%) and the United Kingdom (6.7%) were the most common places of birth for the 21.1% of the residents who were born abroad—a low percentage for Los Angeles. The median yearly household income in 2008 dollars was $75,657, considered high for the city. The percent of households earning $125,000 and up was high for Los Angeles County. The average household size of 1.9 people was low when compared to the rest of the city and the county. Renters occupied 55.9% of the housing stock and house- or apartment-owners held 44.1%. In 2000, there were 837 families headed by single parents, the rate of 11.2% being low for the city of Los Angeles. There were 2,591 veterans, 8.8% of the population, a high figure for the city. According to the Mapping L.A. project of the Los Angeles Times, Studio City is bordered on the north by Valley Village, on the east by Toluca Lake and Universal City, on the south by Hollywood Hills West, on the southwest by Beverly Crest and on the west by Sherman Oaks. The Los Angeles River and Tujunga Wash flow through Studio City. The two concrete-lined channels merge just west of Colfax Avenue and north of Ventura Boulevard adjacent to CBS Studio Center. The waterways are mostly dry except during storms. Dana Andrews, film actor and past president of the Screen Actors' Guild. R.G. Armstrong, actor and playwright. Ed Asner, film, television, stage, and voice actor, past president of the SAG. Bonnie Bartlett, television and film actress. Mayim Bialik, film and television actress. Smiley Burnette, comedic actor, singer-songwriter and inventor. William Shatner, actor, musician, recording artist, and author. Lorin Morgan-Richards, author and illustrator, primarily of children's books. Jerome Vered, record-setting contestant on the game show Jeopardy! Almost half of Studio City residents aged 25 and older (49.4%) had earned a four-year degree by 2000, a high percentage for both the city and the county. The percentage of those residents with a master's degree was also high for the county. The Studio City branch of the Los Angeles Public Library is at the corner of Moorpark Street and Whitsett Avenue. The Studio City Recreation Center (commonly known as Beeman Park) is in a residential neighborhood on Rye Street at Beeman Avenue. It has an auditorium, barbecue pits, a lighted baseball diamond, an outdoor running and walking track, lighted outdoor basketball courts, a children's play area, picnic tables, unlighted tennis courts, and many programs and classes including the second-largest youth baseball program in the public parks. Moorpark Park, an unstaffed pocket park at the corner of Moorpark Street and Laurel Canyon Boulevard, has a children's play area and picnic tables. Woodbridge Park, on Elmer Avenue at Moorpark Street, on the eastern border of Studio City has a children and toddler's play area. Wilacre Park, a 128-acre natural mountain park with the lower trailhead for the Betty B Dearing hiking trail, is on Fryman Road at Laurel Canyon Boulevard. It has a large parking lot, restrooms and a picnic area. It is part of the Santa Monica Mountains Conservancy and is managed by the Mountains Recreation & Conservation Authority. Fryman Canyon Park is a 122-acre nature park accessed via the Nancy Hoover Pohl Overlook on Mulholland Drive with the upper trailhead of the Betty B Dearing hiking trail. The park is part of the Santa Monica Mountains Conservancy and is managed by the Mountains Recreation & Conservation Authority. Coldwater Canyon Park is a nature park adjacent to Wilacre Park and Fryman Canyon Park. It contains an amphitheater and the headquarters for the conservation group TreePeople. It can be accessed via a parking lot near the corner of Mulholland Drive and Coldwater Canyon Avenue and via the Betty B Dearing Trail. The park is managed by the City of Los Angeles Department of Recreation and Parks (LA Parks). This park is not to be confused with an unrelated park with the name Coldwater Canyon Park 3 miles to the south on North Beverly Drive in the city of Beverly Hills. In addition, Studio City has the Studio City Mini-Park, an unstaffed pocket park. Studio City is part of the city of Los Angeles, California and sits entirely within City Council District 2, which is represented by Los Angeles City Councilman Paul Krekorian. Studio City is represented to the city of Los Angeles by the Studio City Neighborhood Council, one of 90 such Neighborhood Councils in the city created and funded by the city of Los Angeles. 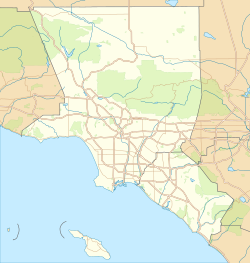 The area is also represented by Los Angeles County District 3 Supervisor Sheila Kuehl, State Senator Robert Hertzberg, Studio City is located in the new 18th District covering most of the Eastern San Fernando Valley, California state Assemblyman Adrin Nazarian and U.S. Rep. Brad Sherman. ^ Rodrigue, Christine. "WEAVING THE WATER WEB: Evolution of the Legal Framework for Water Resource Development in California". CSU Chico. Department of Geography and Planning, California State University Chico. Retrieved 14 March 2016. ^ Wallace, David (2002). Lost Hollywood. St. Martin's Griffin. p. 32. ISBN 978-0-312-28863-1. ^ Jerry L Schneider (2008). Edgar Rice Burroughs and the Silver Screen Vol. IV The Locations. ERBville Press. p. 218. ISBN 978-1-4116-3049-9. Retrieved 29 August 2011. ^ Marc Wanamaker (2011). San Fernando Valley. Arcadia Publishing. p. 45. ISBN 978-0-7385-7157-7. Retrieved 29 August 2011. ^ "Los Angeles Ends Jim Crow Fire Department". Jet. Johnson Publishing Company. 7 (10). January 13, 1955. Retrieved 29 August 2011. ^ "History of the Black Firemen". The Los Angeles Fire Department Historical Archive. 1999. Retrieved 29 August 2011. ^ Rieder, Ron (February 13, 1964). "Kidnap, Free Mrs. Leon Ames". The Van Nuys News. pp. 1, 18. Retrieved September 2, 2015 – via Newspapers.com. ^ Schodowski, Chuck (2009). Tom Feren (ed.). Big Chuck! : My Favorite Stories from 47 Years on Cleveland TV. Gray & Company. p. 124. ISBN 9781598510560. Retrieved 16 April 2013. ^ Waxman, Sharon R. (2005). Rebels on the backlot: six maverick directors and how they conquered the Hollywood studio system. HarperCollins. p. 84. ISBN 978-0-06-054017-3. ^ McKay, James (2010). Dana Andrews: the face of noir. McFarland. p. 22. ISBN 978-0-7864-4614-8. ^ Slotnik, Daniel (31 Jul 2012). "R. G. Armstrong, Character Actor in Westerns, Dies at 95". New York Times. Retrieved 15 October 2018. ^ Bill Newcott (May 26, 2009). "Bill Newcott on "Up"". Movies for Grownups. AARP. Retrieved 20 October 2011. ^ Lauren Beale (April 16, 2011). "Jeff Probst buys Gene Autry estate in Studio City". Los Angeles Times. Retrieved 20 October 2011. ^ Barbera, Joseph (1994). My Life in "Toons": From Flatbush to Bedrock in Under a Century. Atlanta, GA: Turner Publishing. ISBN 1-57036-042-1. ^ Itzkoff, Dave (2006-12-19). "Joseph Barbera, Half of Cartoon Duo, Dies at 95". The New York Times. Retrieved 2008-08-23. ^ a b Borges, Eddie (April 2001). "Striking Out". Los Angeles Magazine. p. 81. Retrieved 20 October 2011. ^ "A new reality series reveals what it's like living with eco-celeb Ed Begley Jr". Grist. 2 January 2007. Retrieved 2010-03-13. ^ "Anti-Defamation League Honors Extraordinary Women Including Studio City's Mayim Bialik". Studio City Patch. Patch. Retrieved 30 May 2012. ^ Stephen M. Silverman (August 27, 2001). "Robert Blake's House on the Market". People Magazine. Retrieved 20 October 2011. ^ a b c d e Mike Szymanski (2012). "Sofia Vergara, Zooey Deschanel, Mila Kunis, George Clooney and Some Studio City Locals at the Globes". Studio City Patch. Patch. Retrieved 16 January 2012. ^ "Clancy Brown's House". Virtual Globetrotting. Retrieved 2 September 2011. ^ "Artists' Activities". Billboard. Aug 23, 1952. Retrieved 20 October 2011. ^ "George Clooney's Home". Virtual Globetrotting. Retrieved 2009-10-08. ^ "George Clooney and Elisabetta Canalis: Getting Serious". Retrieved 2009-10-08. ^ "Gary Cole's House". Virtual Globetrotting. Retrieved 21 June 2010. ^ Emily Shur (July 2009). "I'm a Runner: Jon Cryer". Stories From Real Runners. Runners World. Retrieved 24 October 2011. ^ "Check Out Miley Cyrus' AWESOME New Home!". perezhilton.com. Retrieved 14 March 2018. ^ John Willis. Theatre World 1991-1992. p. 235. ISBN 978-1-55783-143-9. Retrieved 20 October 2011. ^ Lauren Beale (August 8, 2011). "Yvonne de Carlo's former property in Studio City is sold". Los Angeles Times. Retrieved 20 October 2011. ^ David, Mark (26 September 2016). "Leonardo DiCaprio Lists 1930s Ranch-Style House in Studio City". variety.com. Retrieved 14 March 2018. ^ "Dutton and Wife Buy $1.5m home in Studio City, CA". Jet: 61. Nov 22, 1993. Retrieved 20 October 2011. ^ "Zac Efron, The Hunky One, Talks About his Full Body Transformation". Studio City Patch. Patch. Retrieved 30 May 2012. ^ CLAUDIA PUIG (December 5, 1993). "Retro : A New Road Taken : ERIK ESTRADA TAPS HIS LATINO ROOTS IN MEXICO CITY". Los Angeles Times. Retrieved 20 October 2011. ^ Michelle Tan (May 26, 2008). "Is Selena Gomez... the Next Miley Cyrus?". People. Retrieved 17 September 2010. ^ "DallasBlack.com: Interview: Meagan Good". DallasBlack.com. Archived from the original on 2009-01-23. ^ Kam Williams (January 20, 2009). "Meagan Good: The Unborn Interview". KamWilliams.com. Retrieved June 30, 2009. ^ "Cuba Gooding Jr. Biography". The Biography Channel. AETN UK. Archived from the original on 31 May 2010. Retrieved 20 October 2011. ^ Mike Szymanski (1 Apr 2013). "Studio City Superstars Ryan Gosling and Mila Kunis Top Sexual Fantasies Poll". Patch. Retrieved 16 April 2013. ^ Thomas, Kevin (February 8, 2004). "An eye trained on Welles". Los Angeles Times. Retrieved 20 October 2011. ^ Lawrence Grobel (2010). The Art of the Interview: Lessons from a Master of the Craft. Three Rivers Press. p. 88. ISBN 978-0-307-51330-4. Retrieved 29 May 2013. ^ "Lucy Hale Archives - Wetpaint". Wetpaint. Retrieved 14 March 2018. ^ Almendrala, Anna (22 March 2011). "Neil Patrick Harris Lists Studio City Home For $1.59 Million". Huffington Post. Retrieved 27 September 2011. ^ "HOT PROPERTY Actress Jennette McCurdy buys Studio City home". Los Angeles Times. Retrieved 12 July 2015. ^ "Roddy McDowall : Biography". MSN Entertainment. MSN. Retrieved 20 October 2011. ^ Olsen, Larry. "Kevin McKidd Interview". The Job Radio Show. Working Radio. Retrieved 30 May 2012. ^ Mike Szymanski (2013). "'Argo' and 'Life of Pi' Win Most Academy Awards". Studio City Patch. Patch. Retrieved 16 Feb 2013. ^ "Meet Alyssa Milano". Reading Eagle. November 18, 1990. Retrieved 20 October 2011. ^ Inc., Zillow,. "3624 Avenida Del Sol, Studio City, CA 91604 - Zillow". www.zillow.com. Retrieved 14 March 2018. ^ Megan Johnson (2016). "Chloe Grace Moretz Buys $3.4 Million Studio City Starter Home". Trulia. Trulia. Retrieved 22 March 2016. ^ Mike Szymanski (17 December 2010). "Local Guy Bill Nye 'Resting Comfortably' After Collapse". Patch. Retrieved 27 September 2011. ^ Heffter, Emily (June 30, 2014). "Jack Osbourne's New Home: High-Style, High-Security". Zillow.com. ^ " "'90210' Star Jason Priestly Moves to Studio City After Selling Toluca Lake Home". Retrieved 26 September 2014. ^ Ryon, Ruth (June 21, 1998). "Kramer Scoots Outta Studio City". Los Angeles Times. Retrieved 20 October 2011. ^ " Mike Szymanski (2011). "Mason Shefa Wins Gold Medal in Art". Studio City Patch. Patch. Retrieved 4 September 2012. ^ Mike Szymanski. "Closing Arguments End in Anna Nicole Smith Trial". Studio City Patch. Patch. Retrieved 20 July 2012. ^ Times, By Bob Pool, Los Angeles. "Sage Stallone dies at 36; son of Sylvester Stallone". latimes.com. Retrieved 14 March 2018. ^ Bobby Copeland (2009). B-Western Boot Hill: a final tribute to the cowboys and cowgirls who rode the Saturday matinee movie range. Empire Publishing. p. 135. ISBN 978-0-944019-28-3. ^ "Margaret Talbot's The Entertainer an Engaging Tribue". L.A. Times. ^ "David, Stephen, Margaret Talbot--Telling Tales". ^ "Bios - Alex Trebek". This is JEOPARDY! - Show Guide. Sony Pictures Digital Inc. Retrieved 17 September 2010. ^ Barnes, Mike (2016-02-22). "Renee Valente, Casting Executive and Pioneering Producer, Dies at 88". The Hollywood Reporter. Retrieved 2016-03-10. ^ Willis, John (1993). Screen World 1993. Applause Books. p. 268. ISBN 978-1-55783-175-0. ^ ""Like Crazy" Actor Anton Yelchin Snags Studio City Pad". nbcbayarea.com. Retrieved 14 March 2018. ^ Kenny Aronoff interview with The Black Page drum magazine: Part 1 (Interview). 2013. Event occurs at 12:33. ^ PETER KEEPNEWS (January 17, 2008). "Pete Candoli, Jazz Trumpeter, Dies at 84". New York Times. Retrieved 20 October 2011. ^ "Morty Corb, 78, Jazz Bass Player". New York Times. January 17, 1996. Retrieved 20 October 2011. ^ Stewart, Zan (October 25, 1989). "Musicians Set for Clare Fischer Tribute". Los Angeles Times. Retrieved 2013-05-05. ^ Pool, Jeannie G. (2008). Peggy Gilbert and Her All-Girl Band. Lanham, MD: Scarecrow Press. p. 136. ISBN 978-0-8108-6102-2. OCLC 173749535. ^ Kerr, Scott. "Artist biography". www.allmusic.com. Retrieved 22 January 2019. ^ William D. Smith (2008). A Stroke of Luck. Rick Wilson. p. 162. ISBN 978-0615235653. Retrieved 16 April 2013. ^ Szymanski, Mike. "staff writer". Patch. Retrieved 9 November 2011. ^ Winton, Richard (7 September 2018). "Mac Miller found dead inside his Studio City home; drug overdose suspected". Los Angeles Times. Retrieved 9 September 2018. ^ John R. Tumpak (2009). When swing was the thing: personality profiles of the big band era. Marquette Univ Pr. p. 227. ISBN 978-0-87462-024-5. ^ "Gavin Rossdale buys the most expensive home in Studio City". nydailynews.com. Retrieved 14 March 2018. ^ Barry Monush (1995). Screen World 1995. Applause Books. p. 282. ISBN 978-1-55783-233-7. Retrieved 20 October 2011. ^ Rosenblatt, Susannah (December 11, 2007). "Roads open in Studio City". Los Angeles Times. Retrieved 2010-02-23. ^ "Obituaries". The Hollywood Reporter. 28 Feb 2007. Retrieved 20 October 2011. ^ "Pete Wentz Buys Rockin' New Pad in Studio City". Luxe Living blog. 7 May 2012. Retrieved 7 May 2012. ^ Valli Herman (December 17, 2003). "Dweezil makes a brisket". Los Angeles Times. Retrieved 19 October 2011. ^ "Frank Zappa, businessman". Los Angeles Times. 12 December 1989. Retrieved 1 October 2011. ^ Laurie Champion (2002). Contemporary American women fiction writers: an A-to-Z guide. Greenwood. p. 114. ISBN 978-0-313-31627-2. Retrieved 20 October 2011. ^ "Harry Harrison, RIP. And Hollywood crumbles. – Chaos Manor – Jerry Pournelle". www.jerrypournelle.com. Retrieved 14 March 2018. ^ Donald Michael Kraig (2010). Modern Magick: Twelve Lessons in the High Magickal Arts. Llewellyn Worldwide. p. 80. ISBN 9780738728063. Retrieved 16 April 2013. ^ Beale, Lauren (April 10, 2013). "Zack Greinke buys Studio City compound for $4.6 million". Los Angeles Times. ^ Norma Lee Browning (1976). Peter Hurkos: I have many lives. Doubleday. p. 27. ISBN 978-0-385-01508-0. ^ "Los Angeles Public Library reference file" (PDF). lapl.org. Retrieved 14 March 2018. ^ Wharton, David (22 May 1992). "And the Question Is . . . : Will a Studio City Writer Top the 'Jeopardy!' Winnings Total Tonight?". Los Angeles Times. Retrieved 8 February 2014. ^ SCHWADA, JOHN (11 April 1993). "Decision '93 / A Look at the Elections in Los Angeles County : Los Angeles Mayor : Separated from the pack by their public service, 11 candidates are given a fighting chance to win a runoff spot. : Joel Wachs : Focus on a Wide Political Horizon". Retrieved 14 March 2018 – via LA Times. ^ Kenneth T. Jackson; Karen Markoe; Arnie Markoe (2002). The Scribner encyclopedia of American lives. Charles Scribners & Sons. p. 642. ISBN 978-0-684-80663-1. Retrieved 20 October 2011. ^ "Harvard-Westlake School". Retrieved May 19, 2007. ^ "Studio City Branch Library." Los Angeles Public Library. Retrieved on March 19, 2010. ^ "Studio City Recreation Center." City of Los Angeles. Retrieved on March 19, 2010. ^ "Moorpark Park." City of Los Angeles. Retrieved on March 19, 2010. ^ "Studio City Mini-Park." City of Los Angeles. Retrieved on March 19, 2010. ^  Location of CBS Studio Center on Mapping L.A.
^ "WeHo News - News". wehonews.com. Archived from the original on 22 December 2014. Retrieved 14 March 2018. ^ "Fryman Canyon Park". Santa Monica Mountains Conservancy. Retrieved 31 January 2012. ^ "Wilacre Park". City of Los Angeles Department of Recreation and Parks. Retrieved 31 January 2012. ^ "Friends of the Los Angeles River". Friends of the Los Angeles River. Retrieved 31 January 2012. ^ "Brady Bunch House". Virtual Globtrotting. Retrieved 31 January 2012. ^ a b "SurveyLA Releases Findings for South San Fernando Valley Communities" (PDF). Office of Historic Resources. City of Los Angeles, Department of City Planning. 7 (2). April 2013. Retrieved 2 May 2013. ^ Alan Michelson. "Schindler, Rudolph". Pacific Coast Architecture Database (PCAD). Retrieved 2 May 2013. ^ "Studio City Neighborhood Council Website". www.scnc.info. Retrieved 14 March 2018. 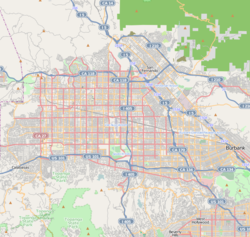 Wikimedia Commons has media related to Studio City, Los Angeles. Wikivoyage has a travel guide for Studio City.